Just north of the Savannah shipping channel lies a pile of rocks that, according to nautical charts, is a submerged breakwater. Local legend has it that back in the olden days when sailing ships made their way into Savannah, this was a designated area for them to drop their ballast, which was rocks. Regardless of how this underwater rock pile came about, every September it serves as a prime location for catching “bull” redfish or red drum. 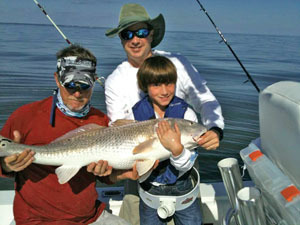 Redfish are probably the most prolific species of game fish in our area waters. They’re found almost anywhere in the region. Anglers chase them on the flats with fly rods and light tackle. Fishing on the bottom in the creeks with live bait or cut dead bait will often produce good catches as well. and by the rock pile. These big guys average between 20 and 60 pounds and will blister a drag on a medium weight reel. Often when the bite is on, you can catch double digit numbers, which makes for quite a memorable day of fishing – even if you have to release them. Live or dead menhaden, squid, mullet or whiting are my favorite bait for catching redfish. A fishfinder rig on the bottom can also be helpful. Occasionally, these local fish can be hooked by fisherman trolling deep lures. I like to use a 20-pound spinning rig for maximum fun, but have caught redfish on lighter tackle as well. However you do it, redfish are “reel” sporty, one of my all-time favorites. If you look closely, you’ll notice this fish on my Bayrunner logo!